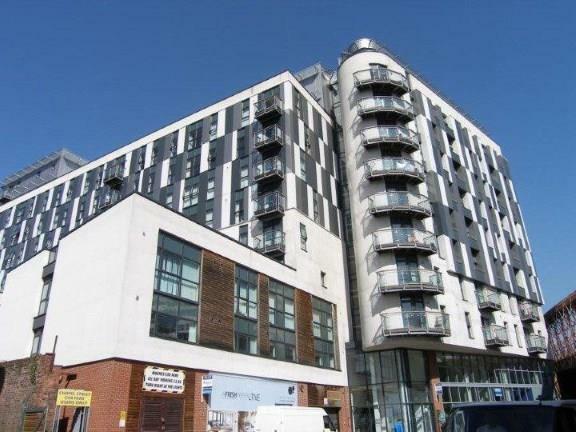 3 Bedroom Flat For Sale in Salford for £190,000. The Fresh Development on Chapel Street sits opposite the five star Lowry Hotel and a brief stroll away from Deansgate and the city centre. Located on the second floor and offering in brief. A hallway with storage cupboard. An impressive lounge with a multi appliance fitted kitchen. Three bedrooms of which two are of a double size with a fantastic luxury bathroom suite and an en-suite shower room to the master bedroom. Double glazed uPVC window facing the side. Electric heater, laminate flooring, painted plaster ceiling, ceiling light. Roll edge work surface, fitted and wall and base units, stainless steel sink, one and a half bowl sink and with mixer tap, integrated, electric oven, integrated, electric hob, stainless steel extractor, integrated fridge/freezer. Heated towel rail, vinyl flooring, painted plaster ceiling, spotlights. Concealed cistern WC, single enclosure shower, pedestal sink, extractor fan and shaving point. Single bedroom; double glazed uPVC window facing the side. Electric heater, carpeted flooring, painted plaster ceiling, ceiling light. Heated towel rail, vinyl flooring, painted plaster ceiling, spotlights. Concealed cistern WC, roll top bath with mixer tap, shower over bath, pedestal sink with mixer tap, extractor fan and shaving point.